Is this the first book you have published? Yes, I write alot (mostly essays and papers) for my own enjoyment, but it was only recently that I started to make my material public. It seemed silly to be so passionate about my work and not share it. What brought about the decision to write Out Of The Shadows? It has been a long time coming I think. As Paganism became more trendy people started to confuse darkness with evil and that really bothered me. That's the essence of this trend in "fluffyness" really. Once darkness is considered evil, anything associated with darkness is shunned and we are left with repressed individuals who claim moral superiority. Part of me wanted to piss them off, and part of me wanted to reclaim darkness within a pagan context. I understand your book culminates from 16 years of practice and study. Can you brief me on the paganism you practice, and the type of study that helped you put this book together? It has evolved over the years. I started out more on the lines of ceremonial magic with no specific leaning on religion, but as a religion Wicca really hit home. I have always been fascinated by religions, especially Taoism, Native American spirituality and Satanism. What a combo! As I started to move from "book smart" to actual practice all these beliefs found their place within a more or less Wiccan framework quite nicely. That was when I started to explore my spirituality on a more personal level to find out what made it tick. Psychology, especially the works of Jung, made that exploration easier. So over the years I have been slowly filling in the blanks and deepening my understanding. When were you first fascinated by darkness? When wasn't I? Skeletons and haunted houses always fascinated me, as did horror movies. My parents told me I would walk around in my Halloween costume for days before and after Halloween and draw haunted cemeteries at school. I was fortunate in that my parents did not try to discourage my interests and thought it cute that I wanted to be a mad scientist when I grew up! My mother even made me a black cape to wear around the house. What kind of response has the book garnered thus far? I must admit it has been much better than I had expected. I was on the defensive, ready to fight for my views when it first came out, but so far apart from a few concerns that I am playing to the stereotype, I have been getting very positive reviews. How have others in the pagan community been reacting to your book? Most have found it food for thought or were happy to see someone stand up and call for balance. Things were really getting "fluffy" to the point of absurdity and many of the older pagans were becoming very bitter about that. How was the process as far as finding a book publisher? What advice can you offer writers trying to find a publisher for their book? Writing the book was easy, getting it published was a pain! I was first going to go with a traditional publisher whose name I won't mention since they may publish my next book. They were VERY interested but wanted me to "soften" the tone. I know beggars can't be choosers when it comes to publishing your first book, but I was very determined to say what I had to say even if it meant finding another publisher. I guess you could say I am a publicist's worst nightmare! As much as I would like the book to sell I was not going to sacrifice content to sell more books. So I ended up self-publishing with what is called "print on demand" technology. It's actually a great concept, but the only downside is I need to work harder to promote my book, and I really hate promoting! Looking back I probably should have published a more mainstream book or two first so it would be easier to publish my more avant guard works. My advice to other would be authors: don't cave in to publishers if it means sacrificing your principles. Publishers just want the book to sell well so they make a decent return on investment. Which dark aspect of the goddess are you must attuned to? I see you mentioned Hecate the most? Ah yes, Hecate and I go way back. My first religious experience was while confronting Hecate and I have been drawn to Her ever since. Psychologically speaking I think much of it also has to do with the fact that my mother died after a 6 year struggle with cancer. I was in 6th grade when she was first diagnosed and as the oldest child, I had to assist her while my father was at work. I am sure that in learning to face and accept death so harshly as a child has much to do with the fact that I am so close to a goddess associated with death. The book itself is very general in the way you presented the various topics. Why did you decide to go this route? The whole basis of "dark spirituality" is that it is a very personal path. The more specific I get, the further from the essence of darkness I would find myself. I decided instead to offer a collage of concepts hoping that the reader would get an overall sense of darkness. I really don't think you can TEACH darkness; It has to be experienced first hand. Also, almost any one of those chapters could have been a book in itself but I wanted to present the concepts in as easily digestible form possible, while not being too basic. I read this book with an open mind and since I have 20 years of experience and knowledge in the various subcultures your wrote about and paganism/magick, in what way can a person like me benefit from reading this book? Well, I hope at least it would provide food for thought. I wrote it for both the novice and the experienced not to so much teach anything specific but to open the doors to new understanding. In fact, I would hope that in reading my book people do NOT always agree with me. Sometimes we learn more by disagreeing than by agreeing. When you accept things at face value you probably don't put much thought into it, but when you disagree, you can explore why. And THAT you can only do by specifically defining your beliefs. Its amazing how often we don't really know what we believe. We might have a superficial concept, but it is only when we are challenged that we start to dig into those beliefs. Much of my personal essays were in reaction to coming across a belief I did not agree with. I would sit down and try to put down my beliefs in writing and why I believed them to be true. Sometimes I found my assumed beliefs did not hold up to scrutiny, other times I strengthen those beliefs. Either way I learn and evolve in the process! Why is it that so many misunderstand the dark side and always associate it with evil? Western culture is very schizophrenic and much of that has to do with the influence the church has had on the Western world view. Don't get me wrong, I am not bashing Christianity and I think it can be a very beautiful religion, but it has been terribly abused throughout history. The church, has fostered a very dualistic society but in designing a world view around good vs. evil there is no way to avoid some major repression. Humans just don't fit into the Christian concept of good. We are naturally egocentric so imposing selflessness only causes internal conflict. When you are stuck in a world view based on an opposing moral dualism you need a scapegoat to maintain some semblance of "sanity". In the 15th-17th centuries witches were the scapegoats, and many innocent people were killed. Today we've toned it down to a degree and just throw all our anxieties being caused by repression into this general concept of "darkness". The chapter on "The Shadow" was very interesting. 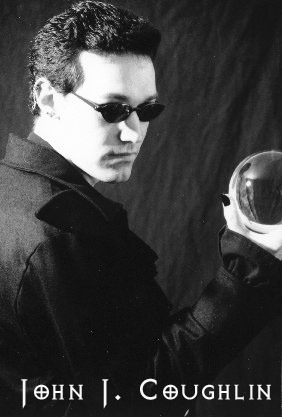 Why is it that so >many who practice magick have such a hard time confronting the shadow? In which ways do you think a pagan can benefit most from confronting the shadow and working with it? I think for starters it needs to be taught more. Confrontation with the shadow is a necessity on any path of self-exploration and will happen on its own when we least expect it. If we don't understand what is happening then we run the risk of deluding ourselves or simply giving up. The experience make us more whole and actually removes the power some of the more negative traits may have had over us. For example if I have come to accept that I have violent tendencies I am less likely to be violent. If I refuse to accept that aspect of my nature I am probably going to have an abusive personality and not even know it! Many fear the shadow since they are afraid that by discovering such a "dark side" of us, we will loose control over it. In reality it is the other way around! In the chapter "The Structure of Magic," you mention that certain systems are worth study. Which systems would that be and why? Actually that will depend on the individual. For example some work better in a shamanic system when it comes to trancework and healing, others need the more structured mental approach of the Kabbalah. What I did in that chapter is look underneath these various traditions and go straight to the foundation on which all these traditions are based. The logic is always the same, but each system has its own way of presenting it and its own set of tools. The trick is the only way to find the right system is to study them all, or at least have a working understanding of several them. I would suggest students be familiar with some of the better known forms of ceremonial magic and Thelema since they are the foundations of more modern forms of magic and ritual, such as is found in Wicca. One would also want to take a look at more "primitive" practices as seen in shamanism around the world. Yoga and Martial arts also have much to teach about the flow of energy in the body and the practical applications of that energy. You barely touched upon Chaos Magic and I feel you should have delved into it some more. Why didn't you? Chaos magic is too... chaotic. A true book of chaos magic would be like an encyclopedia of various belief systems - a treasure chest of symbolism and thoughtforms on which to work with. I was afraid that if I started to dig too deeply into it I would cause more confusion than good. I almost left it out completely since I was not sure if I did the subject justice at all, but finally decided it would to since the book was an open exploration on many topics. Tell me about your disenchantment with the New Age movement? It's very much the same reason I have been disenchanted with Wicca lately. It has become trendy and over run by businesses seeking to tap into its marketing potential. Too many people are getting into it for the wrong reasons. I have to admit, I should not be so hard on the New Age movement. There ARE some people who have stayed on track and gained much spiritual insight, and it is thanks to the New Age movement that many ideas that were unknown of, such as shamanistic practices, have been made accessible to the public. The problem is, much of the material is presented to SELL and not to help, so people start loosing track of the applications of say, Yoga and are too busy choosing what outfit to wear or looking for a rare mat blessed by monks. Way too much emphasis has been placed on the tools and not enough emphasis is being placed on the concepts behind them. Its just like how so many Wiccans are spending hundreds of dollars on these fancy crystal tipped brass wands and have no clue what to do with them. Have you done any book signings for the book? Are any forthcoming? Most of my signings were planned for September and October since I felt the Halloween season was a good time to promote a book like this. The September 11th incident put things on hold since I work in NYC and for a news-related business. So things have been rather insane. I hope to get back to promoting again soon. As for future books, I have a few in the process. One is a beginners book on Wicca, which I did more as a personal challenge to see if I could write one I actually like, and the others range from herbalism to one where I explore magic theory and practice more. I have lots of ideas, but time is another story!! Your internet persona Dark Wyccan best describes you in which ways? How did you come up with the name? It was more of a spoof. "Dark" because I am a goth, and "Wyccan" because I am Wiccan but not quite Wiccan. It just stuck with me so I still use it. Please tell me about all your web projects and how they came about? waningmooon.com was intended to be a haven for anyone gothic or pagan. I am very big on building community over the Internet so I wanted to provide services and forums to meet that need. I also hate when sites get overly commercial and concentrate more on profit than content so I try to keep everything free or donation driven. I would have to say my gothic personals gets the most visits, but my corporate goth site has developed into a real community of friends. I am very proud and honored to be a part of it. What bands and type of music are you into? I'd say gothic and classical music are my two loves. On the gothic side it depends on my mood, but Sisters of Mercy, Sol Invictus, and Dead Can Dance are always high on my list. On the classical side I love Baroque (like Vivaldi) and earlier medieval music. What kind of personality best describes you? Reclusive freak! LOL! I tend to be quiet and keep to myself, but I'm not snobby or anything like that. People tend to label me as a "nice guy" but very eccentric. Who are some of your personal literary favorites? Tolkien would be my absolute favorite. That man was a genius. I love books and own over 1000 mostly on the occult, psychology, and religion but you'll find everything from survival skills to quantum physics stuffed in the shelves. What hobbies do you have outside of writing and your various web projects? I love to hike, which is why I moved upstate. I can walk for miles in the woods just so I can watch the sun set from atop a "mountain". Cooking is another passion, although I rarely have time to make anything exciting. Sheesh, I sound so domesticated! I also enjoy hunting down out of print books for my library. What is upcoming for you? Well I hope in a few months to submit my next book to the publishers. It's an introduction to Wicca but not exactly like the ones already out there. I hate to give out too many details, until its done, but I think it will help establish my name in more mainstream paganism. My goal of course is to gain the confidence of the general pagan community so they will be more inclined to at least examine my views on darkness. I am also slowly redesigning my Corporate Goth site to include more content and services. No set date on the cut-over just yet. © Copyright 2001-1998. DELIRIUM. All Rights Reserved.